Today,Objects made by own hands. Original things help to diversify and decorate any room. In addition, handicrafts with their own hands - this is a very exciting pastime, which helps to cope with bad mood and distract from existing problems. Thanks to the rich variety of techniques, every woman will find a job for herself. In addition, it is worth considering that time does not stand still and every day the "piggy bank" is filled with new ideas. This kind of interesting handicrafts with their own handsAppeared recently. 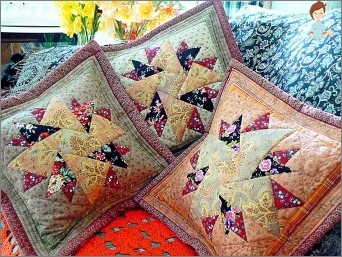 In fact, patchwork is the technique of creating different things from rags. Still our grandmothers, trying to save, collected old things and made of them veils, blankets, etc. To date, we can say that this occupation was "second wind". Today, they create accessories, clothes and other original things from rags. To date, there are different ideas forPatchwork, let's look at a few of them. For example, the traditional option involves the creation of solid canvases from the same pieces. Most often this technique is used to create a tack, cover, etc. Crazy-patchwork is a technique when it comes toFlaps of different shapes, and the seams are concealed with the help of ribbons and laces. Use this option to create coverlets, clothes, accessories, etc. Another popular technique is a knitted patchwork. The difference is that the scraps are not stitched, but tied. Japanese patchwork implies the use ofSilk fabrics and stitches. In this technique, they make bedspreads, clothes and panels. And the last option on which we will stop is quilting, which in translation means quilted cloth. In this case, two parts are connected by a machine stitch, making out different patterns. Still use a soft lining. They make various products in this technique, starting from stitches and ending with clothes. Another new technique of needlework with your own hands, which allows you to create real masterpieces. This is a kind of felting out of wool, it makes it possible to make clothes, toys, accessories and other things. At first it may seem impossibleTask, but starting with the basics, it will be possible to achieve good results in the end. There are 2 options: dry and wet felting. To get started, you need to have a special unkempt wool and needles for felting. Let's start with the wet felting. In this case, it is necessary to use warm water with soap, which makes it possible to make felt from wool. Now go to felting. To do this, rub your hands with the cloth in different directions. New and original things, for example, flowers orToys, can be created with the help of another option - dry felting. In this case, use dry hair and a special needle, which helps to achieve the desired shape. To fix the irregularities, add a little wool on top. Thanks to a large number of schemes and examples, each person will be able to learn felting. 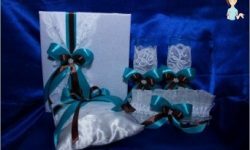 There is a huge number of ideas for needleworkWith their own hands, which allow using various ornaments to create an original frame for photographs, albums and postcards. 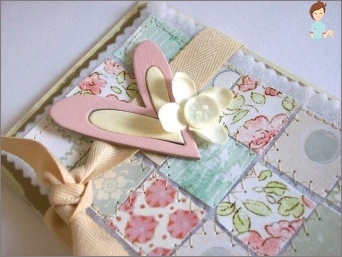 Scrapbooking helps not only to decorate pictures, but also to support the topic and reveal the idea. 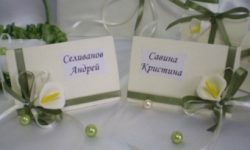 The most popular such handicraftsUses in America, and in the post-Soviet spaces, technology is becoming more popular day by day. To get to work other than the album itself and photos, you need to have tools and materials. Various objects of decor can be purchased in special shops or produced by oneself. Ornaments can be: buttons, ribbons, stamps, rhinestones, etc. To create an exclusive album you need to take different pens, a pencil, a marker, scissors, an adhesive tape, glue. Learn the basics of beautiful handicrafts with your own handsIn the technique of scrapbooking is to start with the most simple things. You can use the ideas that professionals have already come up with, and you can do it yourself. Start by making a sketch to determine where all the details will be. Just keep in mind that, most importantly, this is a photo, and all other items should decorate, but not overlap. For the creation of decor and ornaments, this kind of needlework with their own hands began to be used more recently. Every year the technique is improved, which allows achieving a beautiful and original result. 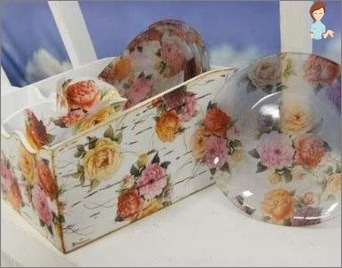 Decoupage is a kind of unusual application thatIt is varnished. As a result, things look like a painting. In comparison with other types of needlework with this technique, even a novice master, who had not previously engaged in anything, will cope. In their works, decoupage was used even by eminent artists. At present, beautiful and original art allows you to decorate, furniture, caskets, vessels and the surface of other objects. It is important that their color is not too dark and better monophonic. Today, three-layer napkins are most often used in the work, so they call this technique a napkin. In order to proceed with the manufacture of the product,It is necessary to determine the decoration object. It can be either a new or an old thing. It is best if it is made of wood. In a special store you should buy napkins, special scissors, brushes, glue, lacquer, acrylic paints. It remained to process all the varnish in two layers to protect the image from moisture and mechanical damage. As you can see there is nothing complicated in this, so if you want, you can easily cope with any task in the technique of decoupage. 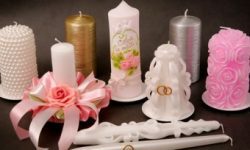 We hope you will find interesting and fascinating handicrafts for yourself that will help not only to create the original thing, but also to improve the mood.